There is nothing that fills me with more than joy than seeing my client’s thrive and reach their goals. One client in particular has made me so proud with all of his hard work and dedication. When Mario first came to me he explained that he had struggled with his weight for sometime and that he had tried every fad diet in the book from weight loss pills to extreme food restriction and nothing ever seemed to work. This is not something I haven’t heard before, there is a reason it doesn’t work because it is just not practical. My approach was to give Mario weekly meal plans tailored to his needs, make sure he understood why he was eating those specific foods, how to prepare these foods, where to buy them. I wanted Mario to understand the importance of eating healthy, and the proper way to do it. 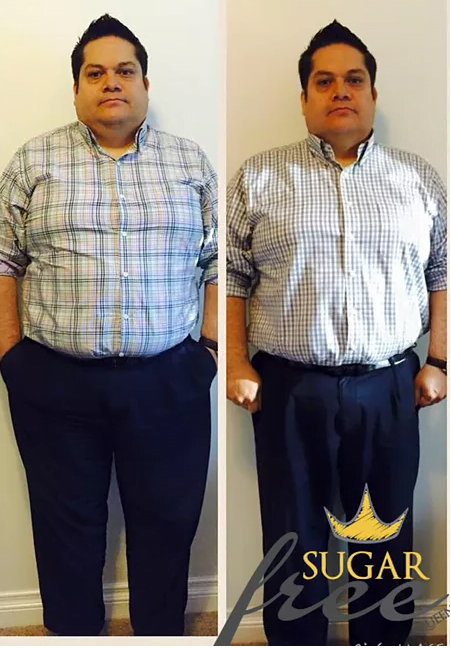 And with that little bit of guidance Mario completely changed his eating habits and after only two short months lost an incredible 40 pounds. Mario’s goal is to continue to lose 100 pounds, and at this rate he’ll be there in no time. He is the perfect example of hard work and dedication paying off. He has not only lost weight but has completely changed his lifestyle in a positive way. Mario is 40 years old, a husband, a father and a student with a fulltime job and he still found the time to stay motivated and live right. THERE ARE NO EXCUSES, expecially when it comes down to your health and his success is a testament to that. In order to really make an effective change you have to be willing to change your habits, your mindset, and ultimately your lifestyle. Real Food is what gives Real Results. That’s why weight lost the quick and easy way, is gained back just as quickly and easily. It’s not about how fast you get there, it’s about what you do to get there. The journey is always more important than the destination, it’s what you learn along the way that stays with you. This is why I firmly believe that in order to care you must understand. In order to understand you must learn. That’s why I am here, to help you learn, to understand your bodies and what they need. Your body is your temple and it is uniquely yours, which means you need to treat YOUR body in a way that’s specific and practical for you. Everyone has their own goals and their own journey, I am just here to help you get there, the right way, your own way. Thank You Mario for being an inspiration to myself and hopefully to all of you looking to make a similar change in your life. Whether its 1 or 100 pounds you want to lose, you have the choice to make it happen, and you can, just like Mario.